Solution IP are delighted to announce that they are finalists in this year’s prestigious Comms Business Awards. The Awards are the Convergence Channel’s most sought after accolades within the UK, as they recognise telecoms industry excellence with their unbiased, independent judging process. Being short-listed for this award means we are being recognised by the industry for our commitment to our customers and our specialist business communications solutions. We are working hard to achieve our goal of becoming the business communications company of choice in Bristol, the South West and across the UK, known for delivering exceptional customer service and implementing the right technology. Achieving award recognition is part of this strategy, and we hope it will continue to prove to our customers that our expertise is second to none. The awards are sought after due to the nature of the judging process: each entry is individually scrutinised by an panel of impartial telecommunications industry experts, who are carefully selected for their ability to assess the entries. Winners are selected entirely on merit, so being chosen as a finalist or receiving a trophy at the Comms Business Awards has real significance. 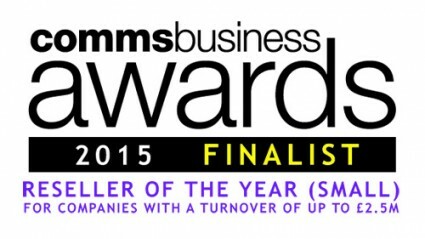 Solution IP are one of five finalists for the category of Reseller of the Year (Small). Award entries had to include a detailed Case Study of how we helped a business to overcome challenges and meet its objectives with our communications solutions and expertise. Entries also had to include a customer testimonial, plans for our business growth and development, and letters of support from clients and principal suppliers/partners. The results are due to be announced in June at the awards ceremony, hosted this year by Actor and Presenter David Walliams. We will be attending the awards- watch this space to see if we win!